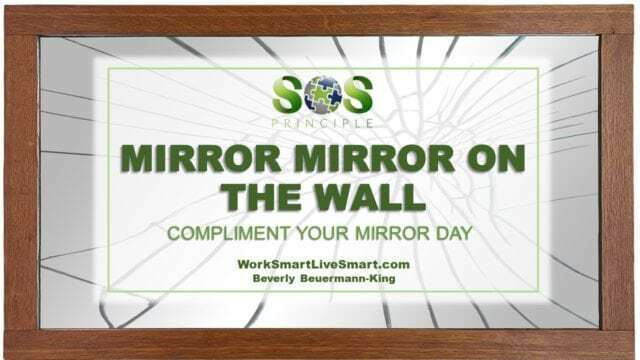 Mirror Mirror: Compliment Your Mirror Day - Work Smart. Live Smart. A fairy tale question that can be the basis for our every day ritual. A mirror image is a reflected duplication of an object that appears identical but reversed, but often, what we see is not just reversed but often distorted. 8 out of 10 women are dissatisfied with their reflection, and more than half see a distorted image of themselves. Compliment Your Mirror Day is a tough one for many of us. For some,mirror mirror on the wall can cause Body Dissatisfaction and Stress. We are critical and we are continually pushed to strive for perfection. Many women and some men spend much of their lives attempting to change their bodies. Only 4% of women globally consider themselves beautiful. The median age for onset of an eating disorder in adolescents is 12- to 13-years-old. The best-known contributor to the development of anorexia nervosa and bulimia nervosa is body dissatisfaction. A positive body image involves understanding that healthy, attractive bodies come in many shapes and sizes, and that physical appearance says very little about our character or value as a person. A healthy body image means that our assessment of our bodies is kept separate from our sense of self-esteem, and it ensures that we don’t spend an unreasonable amount of time worrying about food, weight and calories. Researchers have found that increased preoccupation with appearance and body dissatisfaction put people at greater risk for engaging in dangerous practices to control weight and size. Extreme dieting, exercise compulsion, laxative abuse, vomiting, smoking and use of anabolic steroids have all been associated with negative body image. I am SO guilty of looking in the mirror and picking away at the things that are not perfect: my crooked toes and my short waist. Not to mention my eye lids that are sagging with age and the loose skin on my arms. It is hard to look at yourself in the mirror and ignore what is not ‘ideal’ and to celebrate what is unique and beautiful. Comments from family, friends and others about our, their, and other people’s bodies, both positive and negative. Attractive people have distinct advantages in our society. Studies show that attractive children are more popular, both with classmates and teachers, teachers give higher evaluations to the work of attractive children, that attractive applicants have a better chance of getting jobs, and of receiving higher salaries and they are found guilty less often or receive less severe sentences. Exposure to images of idealized versus normal bodies – According to the CDC, for women ages 20 years old and older, the average height for women in America is 5’3″ and weight is 166.2 pounds. For fashion models the average is 5’10” and 120 pounds. Stanford University and the University of Massachusetts found that 70% of college women say they feel worse about their own looks after reading women’s magazines. And a study published in the journal of Psychology of Men and Masculinity showed that not only did watching prime-time television and music videos appear to make men more uncomfortable with themselves, but that the discomfort led to sexual problems and risky behaviors. When people see the same images over and over and they start to believe it as reality. De-emphasize the numbers. Neither weight, nor BMI are nearly as important as eating habits, activity patterns, and other self-care choices. A Health At Every Size (HAES) approach focuses on body acceptance, decreasing restrictive eating, increasing attendance to internal cues for hunger and satiety, nutrition information, and addressing barriers to enjoyable physical activity and has been found to be a much more successful approach to maintaining and enhancing one’s health. Stop comparing yourself to others. Your physiology is unique to you. Spend time with people who have a healthy relationship with food, activity, and their bodies. It will make a difference in how you feel about yourself. Set a good example for others by refraining from “fat talk” or “old talk” when you are with friends and family. Think of it as the psychic equivalent of second-hand smoke. Practice thought-stopping when it comes to negative statements about yourself. Focus on what you like about yourself. Positive statements need to replace old messages.